Juft Baloot, Zanjabeel, Saad Kufi, Filfil Siyah, Qust Shirin, Kundur, Qiwam Shakar. It helps to treat polyuria. It checks involuntary urination & bed wetting. 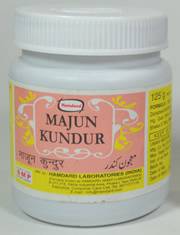 It gives strength to kidney & urinary bladder. 5 grams to be taken alone or with a tablet of Qurs Kushta Khabsulhadid or Qurs Kushta Baiza Murg in the morning & evening. Its useful for me ..